Striking building will provide dynamic new learning environment for students Important next step in Ryerson’s role as city builder. TORONTO, April 6, 2011 – Ryerson University President Sheldon Levy today unveiled the spectacular design of the Ryerson Student Learning Centre, which will be built at the corner of Yonge and Gould Streets. Designed by the acclaimed international architectural team of Zeidler Partnership Architects of Toronto and Snøhetta of Oslo, Norway and New York City, the stunning new building will provide Ryerson students with an outstanding environment to study, collaborate and discover. 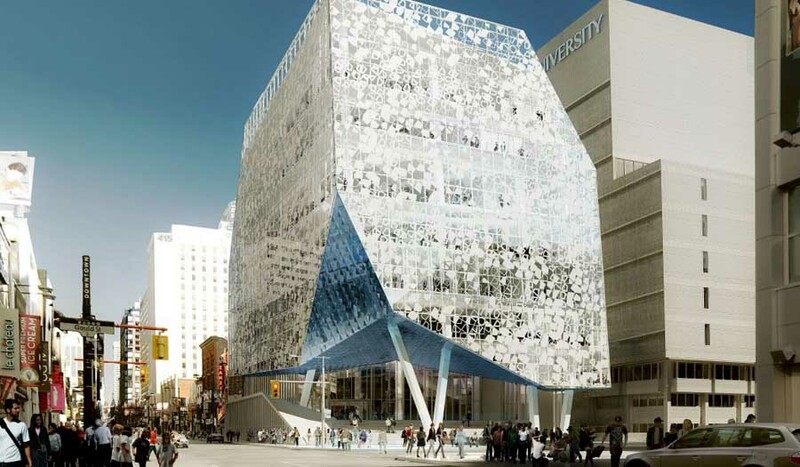 The eight-storey Student Learning Centre boldly marks Ryerson*s new face on Yonge Street. It will feature a dazzling glass façade, a welcoming elevated plaza, a bridge to the existing library and a range of academic, study and collaborative spaces for Ryerson*s students, faculty and staff. Yonge Street frontage will feature destination retail at and below grade, creating a prominent commercial façade. *I am thrilled to present the first look at the inspirational design of our new Ryerson University Student Learning Centre,* said Levy. With links to the existing Library building, the Student Learning Centre will offer a variety of creative and inspiring learning environments and spaces. Every floor will have its own personality – some will be open and interpretive with flexible furniture and terraces while others will be densely filled with enclosed study rooms for groups of four to eight people. Space will be available for independent, quiet study and contemplation. With full digital support and accessible academic services, the Student Learning Centre will foster learning success and help promote a culture of collaboration and creativity among Ryerson students. The transparent glass skin of the 155,463 square-foot Student Learning Centre will feature a surface design that will create varying light qualities within the interior space. As a further demonstration of Ryerson*s long-time leadership in sustainability, the building will be LEED (Leadership in Energy and Environmental Design) Silver compliant. At least 50 per cent of the roof will be a dedicated green roof. *The notion that learning is a static, solitary activity is outmoded,* said, Craig Dykers, principal architect and co-founder, Snøhetta. *While it remains important to find places of introspection, it is also vitally important to create places where people can more activ ely seek knowledge, where social connections can intertwine and where all forms of activity, quiet and loud, can find a suitable home. The design of the Student Learning Centre is foremost about providing these new and diverse functions. Support for the project from the Government of Ontario has been vital. Construction on the building is expected to begin late this year, with a targeted completion date of Winter 2014.